The Tacx Bushido T1980 Wireless Ergo Turbo Trainer is a top end unit that comes with all the bells and whistles you would expect from Tacx. 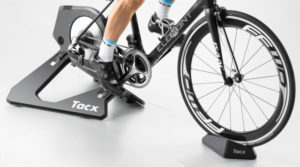 However the unit is not part of the Tacx Virtual Reality range but it is possible to purchase an upgrade kit to allow it to use the VR software at a later date. 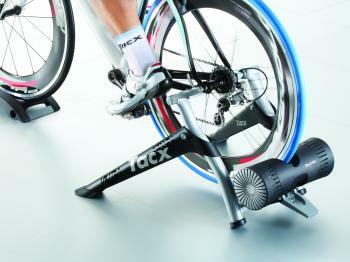 The Tacx Bushido is entirely wireless, there is no need to plug the unit into the wall and the brake communicates with the handlebar mounted computer wirelessly using the ANT protocol. The Bushido allows you to see the difference in power generated at different parts of your peddling stroke so you can see if your right leg is generating more power than your left. The motor brake of the Tacx Bushido means that it can not only simulate uphill resistance, but it can also drive the back wheel to realistically simulate downhills. The motor brake offers a powerful 1400 Watts of resistance. 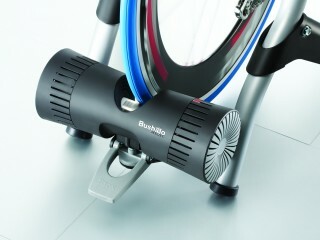 As standard the Bushido is not compatible with Tacx's virtual reality software or interactive videos; however an upgrade to the ‘Upgrade i-Bushido’ makes it compatible. 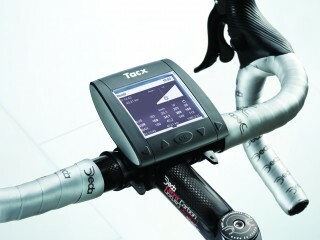 This upgrade includes the Tacx Trainer software 4 Advanced and an ANT+ USB II dongle.